Universal and Paramount are poised to ditch Toshiba's HD-DVD format in favor of the Sony-backed Blu-ray format, Variety reports. Universal's exclusivity agreement with the HD-DVD format has reportedly ended. Meanwhile, Paramount may take advantage of what Variety called an "escape clause" within its HD-DVD contract that would allow the studio to release Blu-ray movies. For the time being, however, both studios are HD-DVD supporters. 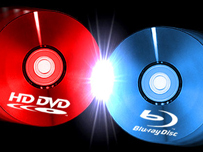 Last week, HD-DVD suffered a major blow when Warner decided to drop HD-DVD support to go Blu-ray exclusive. If Blu-ray does end up winning the format war, Sony's costly decision to include a Blu-ray drive with PS3 hardware would be somewhat validated. Microsoft, which offers an HD-DVD add-on player for Xbox 360, insisted that if Blu-ray does win the format war, it will have no significant impact on the PS3 vs. Xbox 360 war. Toshiba remains steadfast in supporting its format, however Variety suggests that retailers may ultimately make a choice whether or not they want to keep HD-DVD products on store shelves.